If words can be a parameter of expression, a canvas can add many facets to it. Artist Aparna Sahgal's debut series, Astha, walks this line. Not surprisingly, women find prominence in Aparna's works. "The central theme revolves around the Indian women who have always had a fire burning deep inside. The fire is now out in the open and not merely tucked deep inside their souls. If you look closely, each woman in my collection identifies with this thought." Elaborating further, she adds "Having observed the tsumani from close quarters, I have seen many women, who lost everything that was precious to them, rise up like he phone from the ashes to infuse new spirit among the survivors. Having overcome the tragedy, the have learnt to discover moments of happiness amidst the unending sorrows. Astra is a humble attempt to capture this spirit on canvas and pay a tribute to the very essence of survival," she asserts. Aparna's 23 paintings mark the tsunami stricken women's journey over the last year. While the first paintings shows a woman running away from the killer tides, the last shows her holding a baby in her arms - symbolic of her having rebuilt her life. The most intriguing nuance of Aparna's paintings is the eyes of the women; something she wants to leave to the viewers' interpretation. "Eye's are the passage to one's soul and every soul that looks into the paintings, will have his own understanding of the women." If there is one common fibre to all of Aparna's paintings, it is the smile that she has bravely put on every woman's lips. "Be is the smile of remorse or of achievement, it is the easiest expression to don." And everyone should wear it. "Her paintings are characterized by a generous use of color, reflecting a kaleidoscope of human moods. Splashes of sunshine orange and mediterranean blue create an illusion of intense dynamism, as though the men and women spinning through the canvas have succumbed to a soundless, undulating rhythm." 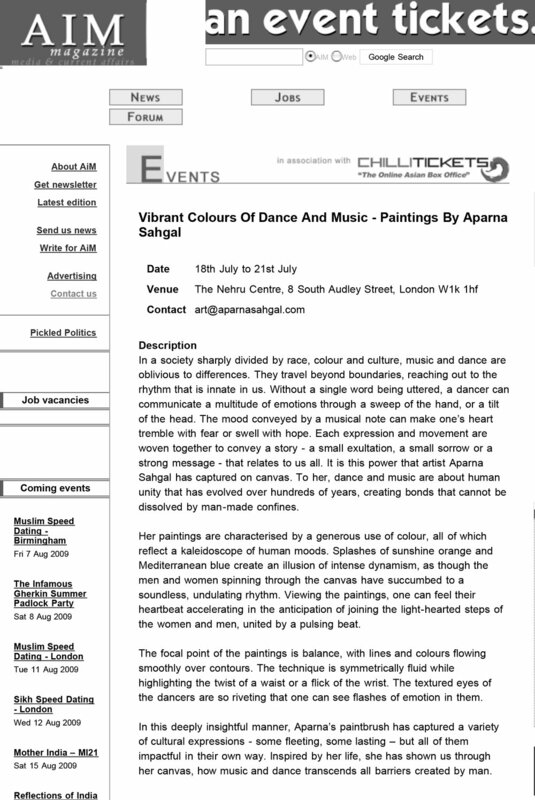 "With acrylics, Aparna's strong brush strokes and distinctive use of color bring her subjects alive to the viewer. Textures eyes feature too predominantly in her works, boldly drawn across each face." Viewing the paintings, one can feel their heartbeat accelerating in the anticipation of joining the light-hearted steps of the women and men, united by a pulsing beat. The focal point of the paintings is balance, with lines and colours flowing smoothly over contours. The technique is symmetrically fluid while highlighting the twist of a waist or a flick of the wrist. The textured eyes of the dancers are so riveting that one can see flashes of emotion in them. In this deeply insightful manner, Aparna’s paintbrush has captured a variety of cultural expressions - some fleeting, some lasting – but all of them impactful in their own way. Inspired by her life, she has shown us through her canvas, how music and dance transcends all barriers created by man. Catching a sneak peek of this German-based artists creativity, put all doubts to rest - the loss of the corporate world can be counted as a gain for the art world. Currently showcasing her work in a month long exhibition titled "The X-Culture" at Gallery Gabrichidze in Brussels, Belgium, she informs, "There are eight artists from different countries taking part int eh show. I am the only artist from Asia."